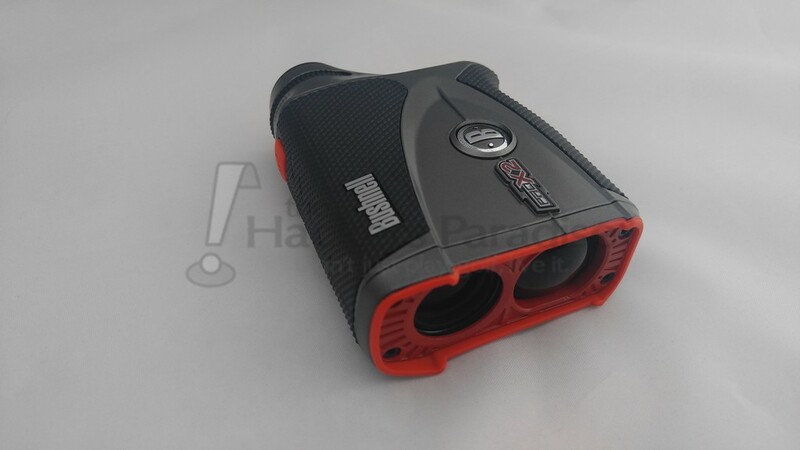 Any rangefinder enthusiast should be familiar with the name Bushnell. Boasting an excellent series of products throughout the past few seasons, like the Tour X and Tour V4, the expectations for improvement and greater efficiencies could not be higher. 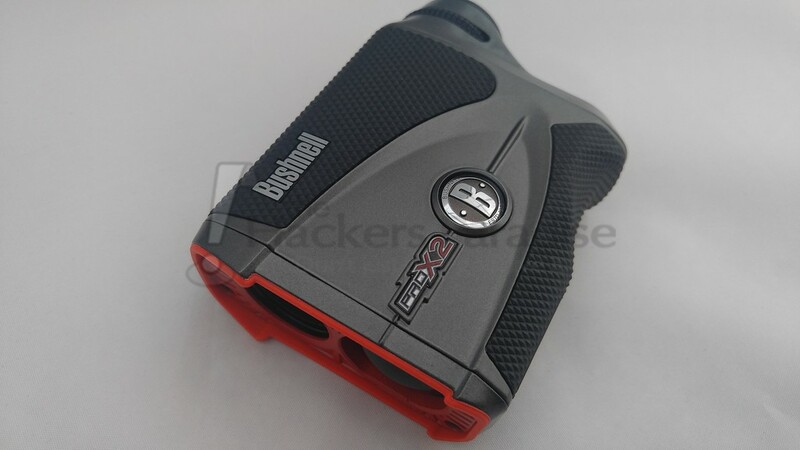 Fortunately for golfers, the introduction of the Bushnell Pro X2 Rangefinder comes with a number of improvements that tie in some of Bushnell’s best ideas, and adds additional features to produce the potential of being the best option available in a package that is reasonably sized. Out of the box, there is a lot to take in with the Bushnell Pro X2. Each side of the device presents an element of adjustment to the overall experience of the unit, and the top location provides easy to adjust visuals with an appropriately placed button for distance measuring. The exterior of the Pro X2 boasts a resilient rubberized armor housing that sits very well in the hand, and the unit itself has a nice weight to it that plays a part in almost subconsciously validating the build quality. Looking through the lens is a reasonably sized display considering the overall unit size, which can offer up to 6x magnification. The alteration to the magnification level is easy to use, but resilient enough to maintain a setting until such time that a change is intended. Arguably the most recognizable feature of the device as it relates to the overall Bushnell brand, is Jolt technology. After locking onto a pin, the golfer is presented with a vibration based confirmation that the device is performing to expectations. By producing such an experience, it provides the golfer with added confidence in the distance acquisition, and triggers an understanding that seeking a number is no longer necessary. Like many devices used in the world today, having an audible or sensory cue tends to make a difference. More impressively, the pin seeker technology that aligns with Jolt is exceptionally fast. While this particular reviewer has experienced a reasonable blend of rangefinder builds, nothing can align or match the speed of the Pro X2. That includes previous Bushnell experiences as well as other products which serve their purpose but take additional time. At a very high percentage, Jolt acquires the flag hyper efficiently and promotes the focus be on the club selection, not the effort to validate a distance. While this next feature may not overwhelm a golfer on a consistent basis, the ability to customize the unit for the type of conditions is taken to the next level with Dual Display Technology. With the click of a button (done excessively during this review out of pure entertainment and curiosity), the device readout can be changed from a black display to a red display. Depending on the course conditions, sun conditions, and backdrop, this provides the golfer with the best possible contrast to get easily readable numbers without being forced to commit to a particular device. Cloudier days where the shaded areas produced a visually darker experience in the lens proved to be the perfect scenario for the red readout, while overly sunny days made the black display stand out effectively. This proved to be another brilliant way to promote a customizable user experience. 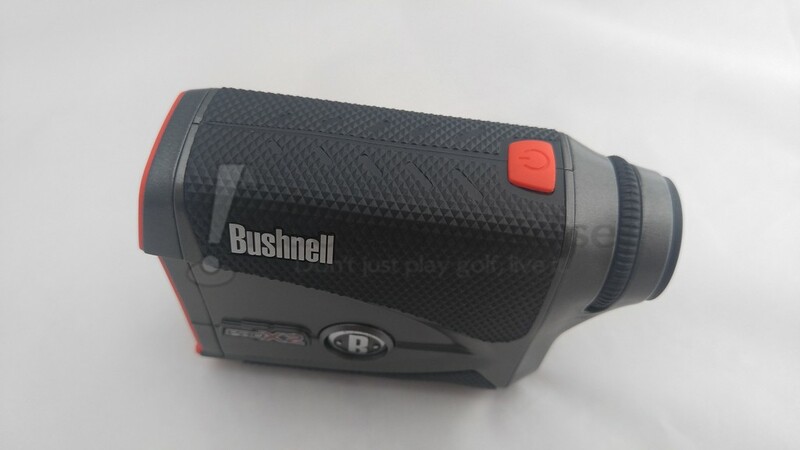 Not unlike many of the experiencing improving features on the Pro X2 from Bushnell, another fantastic alteration is the Slope-Switch Technology. 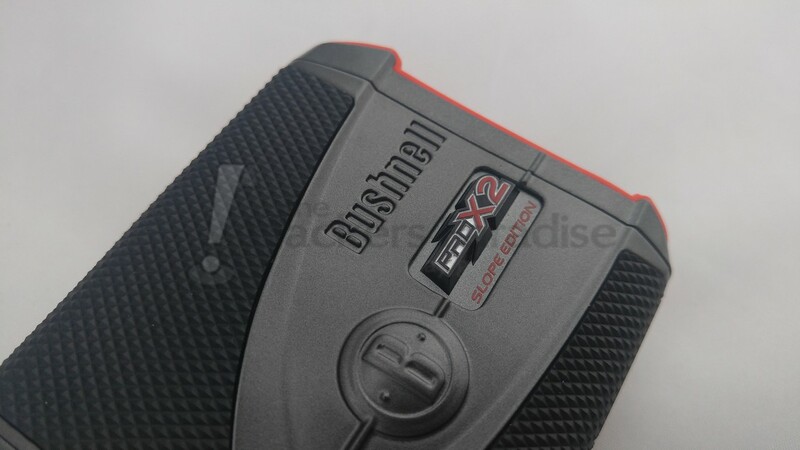 By sliding the “Pro X2” logo on the right side of the unit up and down, golfers can change between a conforming singular readout, and a dual readout with slope. This is a huge improvement from their previous offering which required a change of the entire front section of the device, making it far less likely to use on the fly. While it is not something that was changed regularly during a round, as a golfer who prefers easy to manipulate products, it seemed far more likely to utilize both modes between practice and regular or tournament play. Additionally, the feature is resistant enough to not slide between one mode and the other which should eliminate any concern surrounding unintentional errors during tournament rounds. With regards to their Slope Compensation technology, testing promoted the golfer to not only question club selection, but also the reasoning around why a hole consistently played something other than the regular yardage. Factoring wind, slope, and course conditions, it seemed like the final cog in really taking a hard look at each shot to better understand the golf course. Continuing on that idea, it was quite eye opening seeing which areas on the golf course had a higher or lower than expected slope. There is no question that having this feature on the Pro X2 is a big benefit, but an even bigger asset to remove it on the fly. There are many sources of distance measuring devices available to golfers today, and it seems to be a rarity to have a device operate on a higher level than the pack. In the case of the Bushnell Pro X2, the experience was highly satisfying and notably superior from the first measurement onward. The speed at which it obtains pin locations, the accuracy of the jolt validation, and the clarity of the dual option display produce an experience that is not only beyond reasonable expectations, but really sets the bar higher for future releases. For more information on the Pro X2 Rangefinder from Bushnell, visit www.bushnellgolf.com. Awesome stuff Dan! It seems like they took everything i love about the Tour X and made it easier to use. Great review Dan. It seems like Bushnell may have put together the perfect device in this offering. Great review. This might just be the perfect rangefinder for everyone. Fantastic review. The Dual Display tech is one of the reasons this rangefinder is on my short list. Combine Jolt and the quality and I think it may have just climbed to the top. Very nice review Dan! I like the changes they’ve made with this release. Great review Dan! It seems like Bushnell really nailed all of the needs and wants down in this unit. I’m interested in this one, I really like that you can toggle between slope and non slope and the red and black reticles. Great review as always Dan. This is the one to get for top performance across all categories, I guess you get what you pay for and when prices drop this would be a top contender.